Must be right- Krugman says it! A couple of students from UMass Amherst find a fault in the results by Ken Rogoff and Carmen Reinhart weakening their claim about the proportion of debt to GDP and its deleterious effects. It seems, now that this link appears to be tenuous, the case for austerity in case of many debt ridden EU countries is significantly weakened and finally the Keynesians of the world win the intellectual battle. Certainly, Paul Krugman seems to think that in successive blogposts on the Rogoff affair! 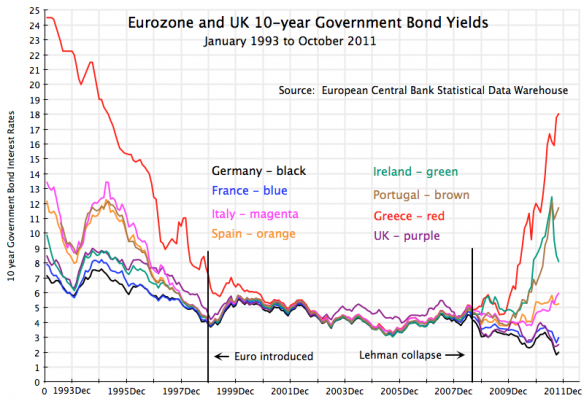 So is the case for austerity for these debt ridden EU countries really that tenuous? Should they be allowed to continue to inflate their way out? I do not think so. A clear picture of what plagues EU can be found here. The theoretical and empirical evidence against government spending as a way out of economic problems is overwhelmingly in support of austerity. Empirical work by Barro clearly shows that even with huge government spending shocks, the expenditure multiplier tends to just a little over or equal to 1. Moreover, theory tells us that polices that alter the incentives people face will tend to work far better in stimulating the economy in the desired direction. Even if there is deficient private demand, just filling in the gap will just do that- plug the hole. It does not affect the behavior of private sector in the long run. For example we know that the 2008 tax rebate did not move current consumption at all. Savings went up and people paid down the debt that was accumulated in the past. Sometimes even seemingly well intentioned policies can have opposite effects. Casey Mulligan makes an interesting case for this in his latest book, “The Redistribution Recession”. There might be some case for government spending or inflation tax in developing countries. The presence of a substantial informal sector and significant positive returns on investment in public infrastructure are the cases in point. But you cannot have the same prescription for every country, and hence the Keynesians or Left thinkers especially in developing countries should not take shortcomings in Rogoff and Reinhart’s work as their victory. Increased government expenditure on employee salaries is still unproductive and deficient private demand (if present at all) may still not be corrected with it. And that replication of results should be still taken seriously before we base policy prescriptions on them. As by now you must be aware that Krugman wrote this longish essay criticizing economics and economists for their failure to forsee the crisis. If you have not read it yet, you can do so here. John Cochrane of Chicago Booth School of Business has a well written rebuttal titled, “Why did Paul Krugman get it so wrong?”. You can access it here.